BALA CYNWYD, Pa., Dec. 17, 2018 /PRNewswire/ — Driver choices are linked to 94 percent of serious crashes, according to the National Highway and Traffic Safety Administration. Philadelphia Insurance Companies (PHLY) is offering eligible policyholders complimentary access to PHLYTRAC, a GPS monitoring solution to help businesses monitor their fleet and lower the risk of driver-related accidents. PHLY’s 18-month pilot of the program showed a significant decrease in driving behaviors identified as most likely to lead to accidents. 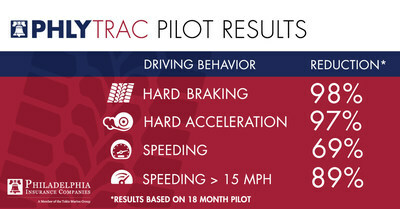 Unlike previous versions of GPS units, which required installation by mechanics, PHLYTRAC installs easily in minutes. Businesses get real-time insights on their drivers’ behavior, allowing for safe corrections that lower the risk of driver-related accidents. The program includes live maps, driver scorecards, and a fleet management dashboard with vehicle health and more. PHLY agents and customers can request more information about the PHLYTRAC program at www.phly.com/phlytrac. Philadelphia Insurance Companies designs, markets, and underwrites commercial property/casualty and professional liability insurance products incorporating value added coverages and services for select industries. The Company is rated “A++” (Superior) by A.M. Best Company and “A+” for counterparty credit and financial strength by Standard & Poor’s. In business for over 50 years, PHLY is nationally recognized as a member of Ward’s Top 50, one of the Best Places to Work in Insurance, and one of the Healthiest 100 Workplaces in America. The organization has more than 50 offices strategically located across the United States to provide superior service. For more information, please visit www.PHLY.com.